Today's theme is "I Believe in Agricultural Education." My belief in agricultural education runs deep. My grandfather started an agricultural education program in Pine Grove, PA and stayed there until his retirement. Unfortunately, he never got to see me take off as an FFA member and agricultural education teacher as he passed away when I was in 8th grade. My grandmother and father constantly mentioned the pride my grandfather would have had in seeing me grow up to believe in agricultural education as he did. With family inspiration and a devoted agriculture teacher as a mentor and role model, I pursued agricultural education. From teacher to FFA specialist and back to teacher, it is a profession I have been in since I graduated from college. 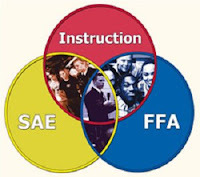 I value the three component model agricultural education offers (FFA, SAE, and classroom instruction). Helping middle school students explore careers, even if their supervised agricultural experience is as simple as helping with a pet at home, gives them a firm foundation in considering options for their future. Providing opportunities for leadership experiences and competitive events through FFA help them develop life skills they will use whether or not their future includes agriculture. Conducting classroom instruction to help create agriculturally literate citizens is vital to fostering appreciation for where our food and fiber comes from. What helps to sustain my belief in agricultural education is the parents who support their children, the colleagues nationwide who share my passion, and the youth who I am blessed to work with.